Also in the workshop manuals, possible malfunctions of the Mazda 3 are considered and methods for their elimination are studied, the mating dimensions and parameters of the main parts and components of the car are presented, the limits of their permissible wear are indicated. In addition, a motorist will find information on professional-recommended lubricants and fluids. The Bodyshop Manuals are designed primarily to assist technicians with location, identification and assembly of vehicle body components. The Bodyshop Manuals should be used in conjunction with the relevant vehicle Workshop Manual. 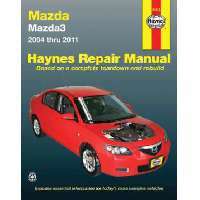 Workshop and Bodyshop Manuals available are applicable to Mazda vehicles imported by Mazda Australia. Free workshop and owners manuals for Mazda vehicles. Download as PDF or read online. Mazda 6 Workshop Manual with L8 (1.8 L), LF (2.0 L) and L3 (2.3 L) Gasoline Engines. Including restyled models since 2005. Catalog of spare parts. Typical faults. Guide to repair and maintenance.